Constant Contact and Turnstone will host two sessions. The first session facilitated by Constant Contact will help you simplify Social Media Marketing. Turnstone will then facilitate an interactive session pertaining to productivity wherever you work. Both sessions will be followed by a cocktail/networking hour! Have you thought about selling through Facebook? You can have a "shop now" button on your Facebook business profile. It can work as a second website for you. You can interact with personal Facebook profiles as a business. LinkedIn utilize the links page to link to your business. Not much else on LinkedIn other than keep building your network so it will help your company. Have a promo to get fans to "like" you on Facebook' This will help build your customer base when you are trying to grow. Use interactive icons: (Follow us on Facebook or Twitter) Out going email signatures, business cards, printed material. 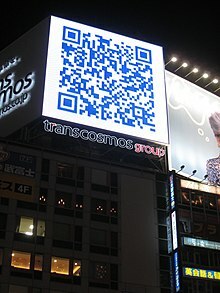 Use a QR code so people can use camera phone to link to you. Lastly, she had an example of a nail salon that used phrases for discounts. If they heard about a promo on Twitter the customer would come in and say, "I love nails" and that would get them that deal. If they said, "Nails are great" then he would know that they used came to him via Facebook etc. Presentation was done by Corissa St. Laurent and she was very good. Create a re-charge place. A place that you go to clear your head. Outside, play games (pool table), a quit place, a walk) Threadless actually has a Air-stream trailer in there office where people can go and hide out to recharge. Know when you work best. What time are you most affective and plan your day accordingly. A great rule for an office. "Don't interrupt me" rule. If you have earphones in do not interrupt me. Or green, yellow, red bean bags on your desk. Each one lets people know if you can be approached. Sitting position is important. Monitor at eye level. sit with your knees 2 inches out from the end of your chair. Stand occasionally. Did you know that when you break your concentration it takes 20 minutes to refocus on your task. 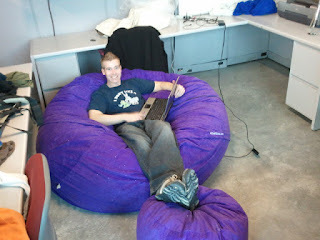 I just thought of having a giant bean bag to take a break from my desk. I think I may go buy one. Happy to say my Ultimate Sack came today. 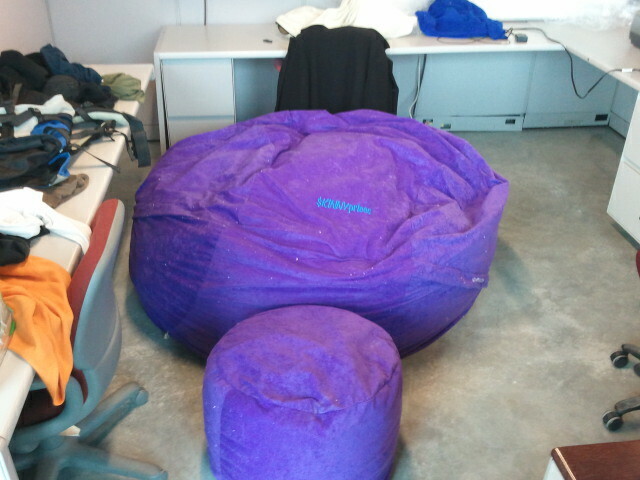 I opened it up and fluffed it up! It has my company name on it and the company colors. Tried it out and it is comfy as can be, Hopefully this will help eliminate the pain in my non-dominate side of my neck. So there! Take that NECK.